I posted this over on my Facebook page. I remembered just now there are many who are coming to this site that are not on Facebook. I wanted to be sure to share this with everyone at large, not just the Facebook only group. “The Gang”! I tell you what, such a great group of young family being so generous with their precious few summer hours. I created a video to share a short form of my testimony for those who haven’t met me. Sort of a big picture testimony. Again, this was created with the fundraiser for South Texas in mind. I published this while in the hospital for round #2 of chemo. I will be getting a video out at some point with pics and such from the lemonade stand and all. It is really cute! If you are interested in a bracelet, please email to walkingthroughthistogether@yahoo.com the place you would like the bracelet(s) mailed to. We’ll put postage on there to cover cost of the bracelet. I hate to admit, but I don’t even know the cost yet. I think they’ve been nearly giving them away, as the sign says you get lemonade and bracelets for $1. Wow! What a bargain! Isn’t this a creative clever sign? I’ll pass on the mailing address and how many bracelets you want to Mandy, Kristi, Jayne, and whoever else are helping out. 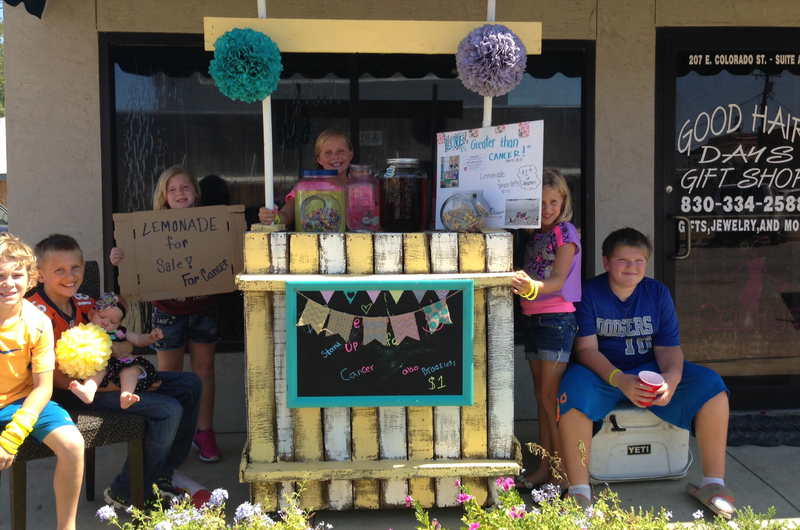 Included a couple of pics of the Lemonade stand in Pearsall Texas. They have really touched my heart with their generosity, creativity, and support. Thanks so much! 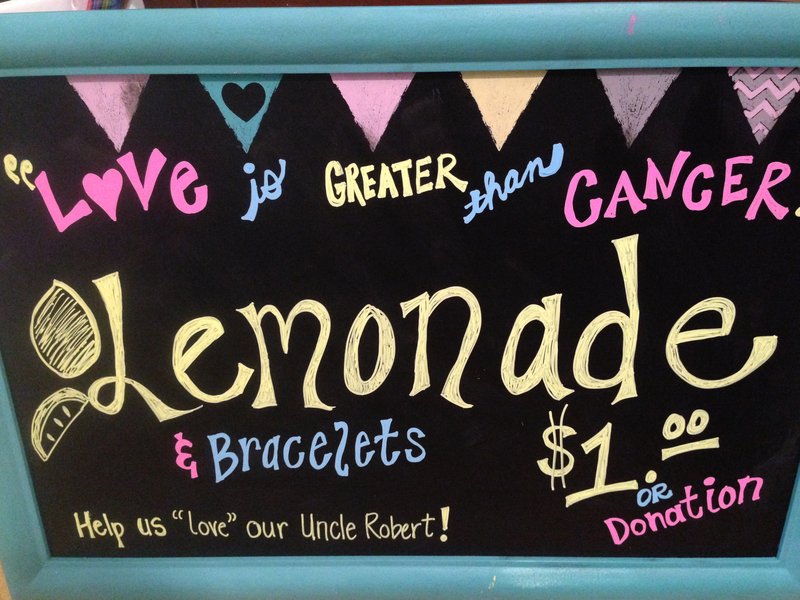 This entry was posted in burkitts, cancer, chemotherapy, healing, hope, lymphoma, Uncategorized and tagged bracelets, fund, lemonade, love, pearsall, stand, support, texas. Bookmark the permalink.